At the Bukit Bintang entrance, walk through the ‘Arch of Longevity Peaches’ for a taste of abundance and sweetness. Then stroll down the ‘Steps of Sweet Scents’ where you will enjoy a floral scent-experience, presented for the first time in a mall festival. Behold the sight of the ‘Auspicious Golden Monkey’, standing 30 feet tall on a mountain of gold and fortune. Toss a coin into the mountain and be bestowed with good luck and fortune throughout the year. 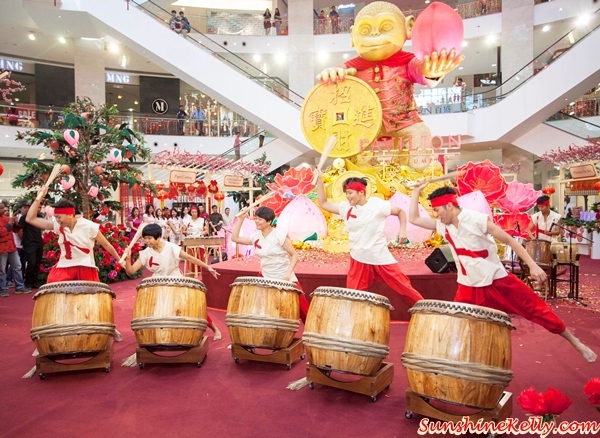 The Chinese New Year Charity Gallery was unveiled showcasing the collections of gifts available for shoppers to purchase. 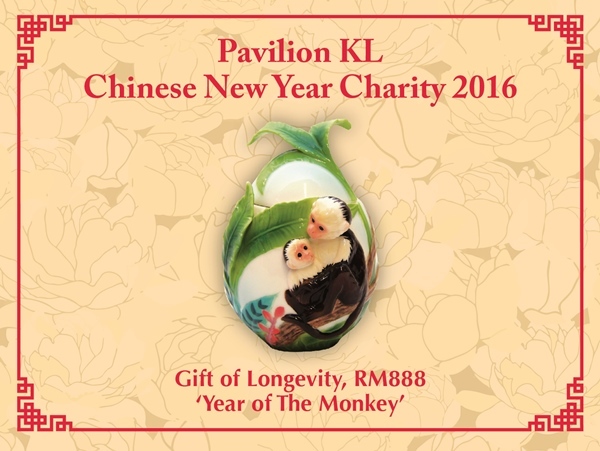 There are three collections of gifts to raise funds for Old Folks Homes nationwide and nine special Children Homes, as part of a collaborative effort with APOH (A Piece of Hope). 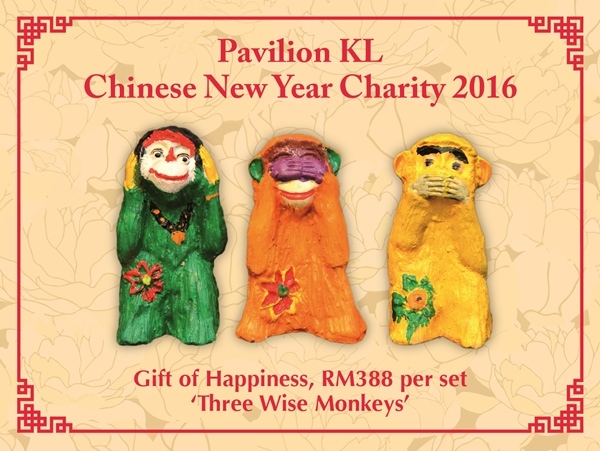 This THREE WISE MONKEY Set is hand-painted by the children of nine special homes and each set is unique in its design and inspiration. The sale proceeds will be fully donated to the nine homes. (Tax-exempt receipt available upon request). 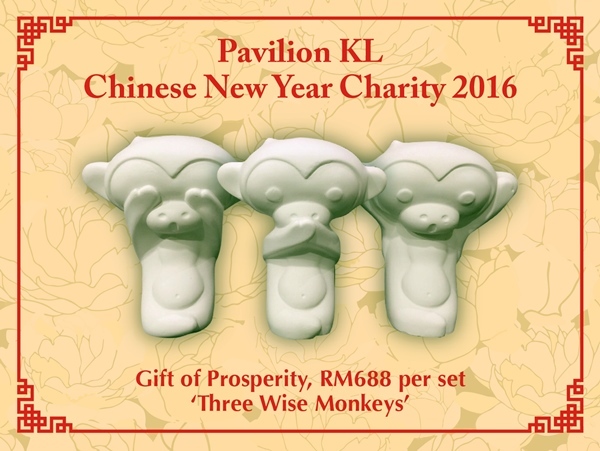 Limited to 300 sets only, this THREE WISE MONKEY set is exclusively designed. At 8-inches tall, you may personalize your own gift set by painting it. Sale proceeds will be fully donated to the nine homes* (Tax-exempt receipt available upon request). Limited to 200 pieces only exclusively at Pavilion KL, this Franz ‘JUNGLE MONKEY’ collection porcelain jar is unique and intricate in its design. Sale process will be fully donated to Old Folks Homes nationwide. Wow! That's an awesome event at the mall. I bet there's more decorations and festivities come Chinese New Year on Feb 8. Wow, thats quite a unique celebration. Would have loved to visit. Selling something people would want to buy to be able to help is such a good cause. I'm sure this will be successful. If only I'm near if love to purchase one too. I love that celebrating the New Year also involves helping people. That's really nice. This is such a fun event! They really made the place a very festive place. You also get to see choices for charms and gifts. 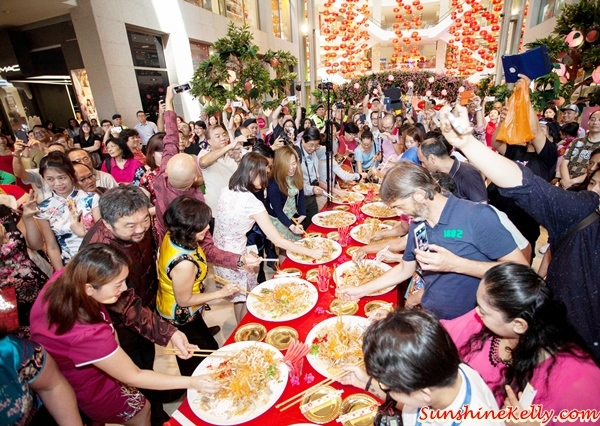 Chinese New Year is really becoming a big commercial event as much as Christmas is. So big and fancy! All those good luck charms for sale as well. It's always fun to be doing lo-hei with a group of people as the positive atmosphere made it seem like a great year! Will do that nearing new year! I was learning about this in my cultural class at uni this morning. Great to see some actual pictures of what goes on. Enjoy New Year!